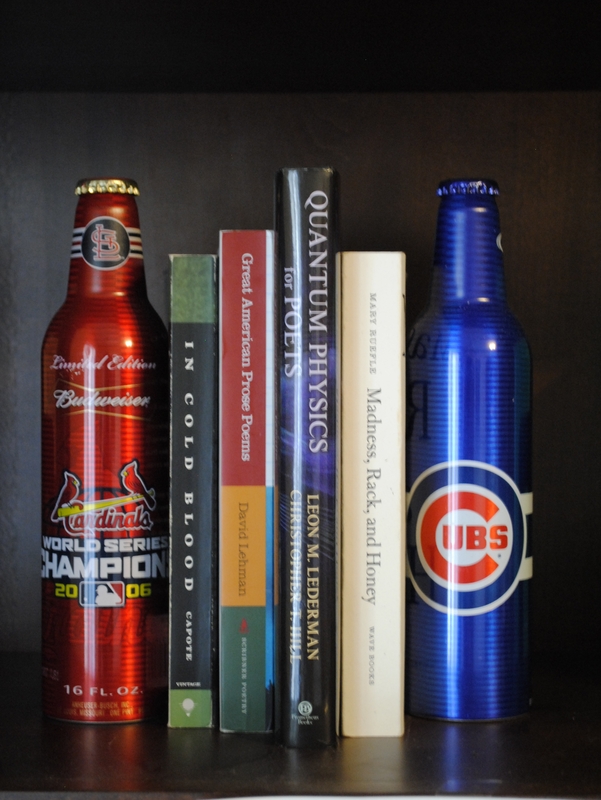 In the spirit of peaceful cohabitation in light of irreconcilable differences (Cubs v. Cardinals: Talk about intersection! )… and also in the spirit of Opening Day, here’s a photo for you. To honor this kind of fierce intersection, I’ve posed two of our commemorative beer bottles (really, what do the Cubs have to commemorate?) alongside some notable works of boundary blurring. 1) In Cold Blood. Is it nonfiction? Fiction? Creepy? 2) Great American Prose Poems. Prose poems. Nuff said. 3) Quantum Physics for Poets. Science meets art. Or at least, Science meets layperson. 4) Madness, Rack, and Honey. “Essays,” nominally, but I contend they’re about as poetic as anything out there.